Georgia secretary of state Brian Kemp’s “humorous” campaign ad is raising some hackles. It’s primary season around the country, and in many competitive Republican races, we’re seeing the familiar dynamic of candidates trying to pose as the “true conservatives” and the true MAGA-committed friends of Donald Trump, as opposed to their RINO squish liberal opponents. Sometimes, this dynamic, along with the desire to create memorably edgy or “funny” images in ads, has led candidates into dangerous territory. That’s possibly the case with a new ad from Georgia secretary of state Brian Kemp, who is running for governor. It’s a real knee-slapper, in a 1950s sort of way. State Sen. Michael Williams, who was the first Georgia elected official to back Donald Trump’s presidential campaign, said there is “zero evidence” banning bump stocks would prevent gun violence deaths, and he’s giving one device away in a show of support for the Second Amendment. While I wouldn’t go so far to suspect that these complaints emanate from Kemp’s own camp, it probably is just fine with the candidate to get some publicity for being too gung-ho for guns. The gubernatorial primary is just three weeks away, and Kemp is competing with Hill, Williams, and several other candidates for a July runoff spot alongside two-term Lieutenant Governor Casey Cagle, who is sure to run first on May 22. Cagle, it should be noted, has already snagged the endorsement of the National Rifle Association, so egregious displays of gun-hugging like Kemp’s are the best and perhaps the only way to show right-wing bona fides in a field where absolutely everyone self-identifies as a “conservative” (Cagle), or a “Christian conservative” (Hill), or as a “fearless conservative” (Williams). 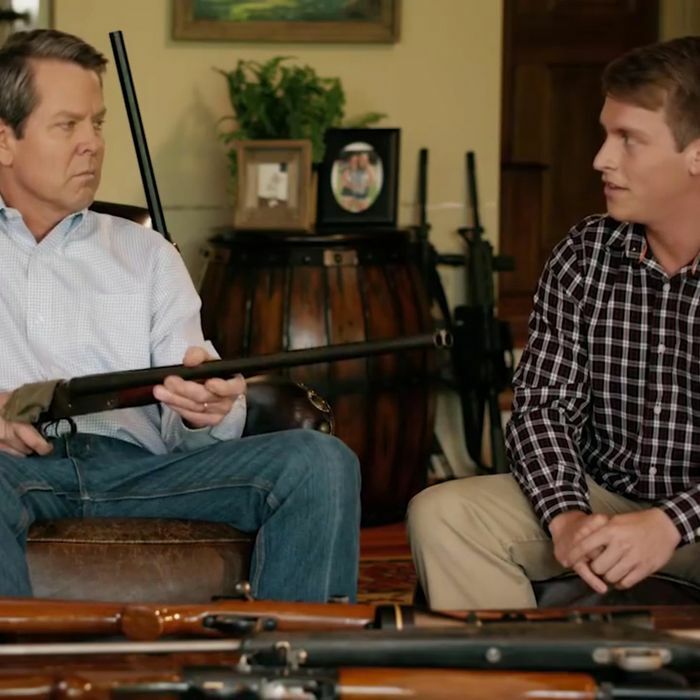 The gun issue is one of many areas in which the general election in November will test whether Georgia Republicans have gone too far off the deep end to continue to dominate a state whose demographics are trending steadily blue, and where Democrats will choose between two high-profile gubernatorial candidates on May 22, giving them a bit of a head start. At some point, if not this year then soon, the path to statewide office in this rapidly changing state may no longer be trod exclusively by aging white men who are avid to make sure voters know they are armed to the teeth and ready to blast away at anyone who would challenge Georgia’s commitment to militia-style super-patriotism, fundamentalist Christianity, and giving corporations absolutely everything they want. Who knows, someday a Republican in Georgia might even run as a “moderate.” But then that might also be a sign of the End Times.